Apple's supply chain has huge expectations for the anticipated flagship 2017 iPhone, projecting as many as 70 million shipments next year for the all-new design, rumored to feature a 5.8-inch AMOLED display. Citing Apple suppliers in Taiwan, DigiTimes reported on Thursday that global shipments for the so-called "iPhone 8" are currently estimated at 60 million to 70 million units for 2017. If current expectations hold, those sales would be in addition to smaller "iPhone 7s" models sized at 4.7 and 5.5 inches. Multiple reports have suggested Apple will expand its annual iPhone upgrade cycle with three new models to debut in late 2017. It's rumored initial production of the flagship "iPhone 8" will begin in March 2017, ahead of an expected September launch. Thursday's report also reiterated earlier rumors claiming that Samsung will be the sole supplier of OLED panels for the 5.8-inch "iPhone 8." It was said that Samsung will be able to supply 20 million units per month, maximum, to Apple for its flagship handset. Other supposed suppliers mentioned include Nissha Printing, which is expected to provide touch sensors, and TPK Holding, which could win a contract to bond those sensors to the AMOLED display. 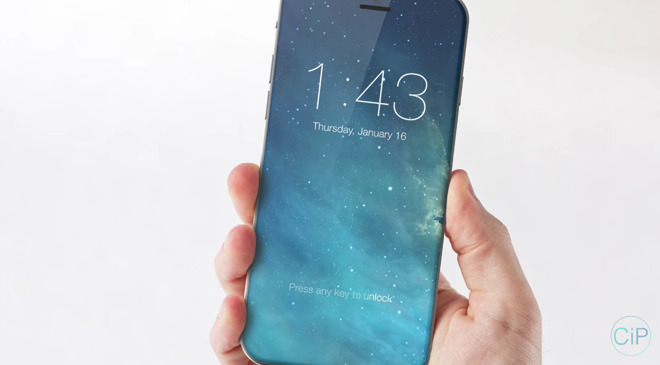 It was said that small volumes of production of the flagship "iPhone 8" will begin in March 2017. Output is expected to increase in May and June, which could put it on track for Apple's typical annual September release. DigiTimes has a hit-or-miss track record on Apple future product rumors, but the publication does frequently have inside information on supply chain minutiae, particularly which component makers have landed contracts to supply parts. 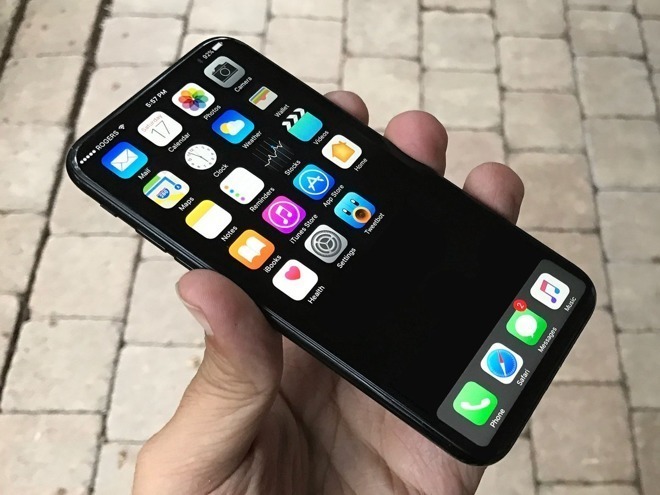 Analyst Ming-Chi Kuo of KGI Securities believes that most new iPhone sales in late 2017 will go to the OLED "iPhone 8," predicted to account for between 50 and 55 percent of shipments of new models. With a new bezel-less design hiding key components —such as the earpiece and Touch ID fingerprint sensor—underneath the screen, the OLED iPhone is expected to be a radically redesigned handset celebrating the 10th anniversary of Apple's iconic smartphone. Rumors remain split on the size of the display, however. While Thursday's report aligned with earlier claims of a 5.8-inch display, Kuo believes that the usable area of the screen could be smaller, in the 5.1- to 5.2-inch range. Regardless of the usable and visible space on the final product, both sides agree that Apple plans to buy flexible OLED panels from Samsung sized around 5.8 inches. As for the "iPhone 7s" upgrades, they're expected to feature LCD panels matching the same 4.7- and 5.5-inch sizes of the current iPhone 7 and iPhone 7 Plus lineup. Less dramatic factor modifications are expected for the "7s" series, mostly in the form of a glass rear casing instead of metal.